Location: Selena Hotel is located in the central part of the sea alley, right in front of the Yacht port in Balchik and just 500 metres away from the Balchik Palace. The hotel offers a stunning sea view from the first floor balcony. Accommodation: Selena Hotel offers 4 double rooms and 2 studios. All roooms are comfortably furnished and offer all modern facilities, such as air conditioning, refrigerator, LCD TV set, cable TV and luxurious furniture. The studios offer a kitchenette will all necessary appliances. 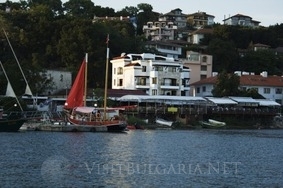 Wine and dine: The restaurant of the hotel serves delicious Bulgarian and international cuisine in a romantic atmosphere.